It was perhaps fitting that, the weekend immediately prior to today's 100th anniversary of the beginning of World War I, Chesterfield FC's Memorial Garden would be see its first memorials unveiled in the presence of The Mayor of Chesterfield, Cllr Alexis Diouf, Mr William Tucker Lord- Lieutenant of Derbyshire and the High Sheriff of Derbyshire, Mr David Coleman. 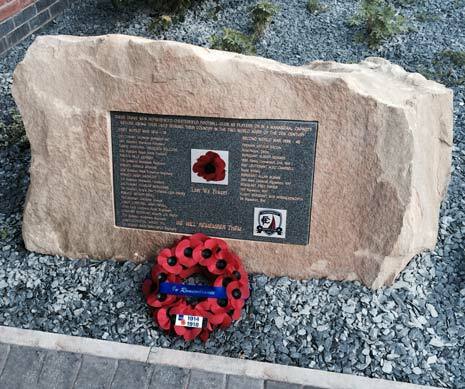 As part of a Gala Dinner which celebrated the completion of the 'first phase' of the project, guests gathered outside at the newly created garden at the rear of the Proact's East Stand, to take part in a ceremony to remember the fallen players and officials at the club - and pay respects to some of those who had served the football community. The project - which saw the first sod dug in June 2014 - has seen a mass outpouring of goodwill from the community and local businesses who have donated services and goods, along with a hugely successful fundraising drive which again, has seen supporters and staff from the club donate items which have been auctioned, with the proceeds going to the costs of the garden. A total of £35,000 was deemed necessary to complete the project - and so far the total stands at over £33,000. The Bob Pepper Memorial - Bob was a long serving club Secretary and Director. The British Legion Plaque - To remember the fallen. The Fred Greaves VC Plaque - this was due to be revealed by his daughter Hazel but, having suffered a tumble days previously she was unable to attend, the High Sheriff therefore unveiled the memorial. 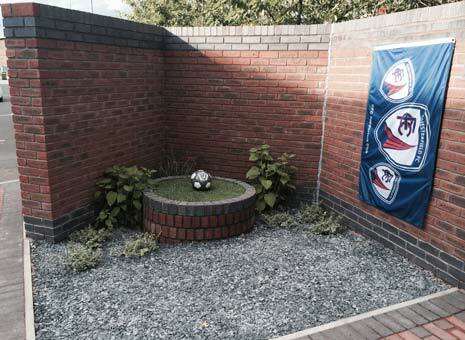 The Chesterfield FC Fallen Memorial. Following the unveiling of these memorials (above), by family members and dignitaries, the Last Post was played by Adrian Wood, and a wreath laid by Club Historian, Stuart Basson and Ian Bowse from the Garden Fundraising Committee. A clearly emotional Phil Tooley, who has spearheaded the fundraising initiative, told The Chesterfield Post how proud he was of the project's success, "We've finished the construction of the Memorial Garden - the only phase one elements to come are to put a pergola in and a couple of seats. Today we're unveiling a number of memorials." The Memorial Garden has a more personal objective too, somewhere ordinary supporters can place the ashes of their loved ones and Phil added that the process has begun, "Last week in the round dias with a marble football on top, we interred a number of ashes for people who'd been previously interred at Saltergate - the club Chaplain Jim McGlade conducted the service and yes, members of the public can ask to have ashes interred and can have a plaque on the wall here, I just hope people come and have a look. "It was touch and go - it's 6.20pm now but at 5.10pm I was waiting at the wall to have the last memorial put up. Whilst I've been sitting waiting, there has been quite a few coming to look around at the private memorials for loved ones and I think that as soon as people see it that wall will start filling up. "The profits from that will keep on improving and maintaining the gardens. We are remembering Saltergate too, there's the old turnstile there and three keystones from projects that supporters finished - and they were chipped out from Saltergate and incorporated into the garden. "It's a proud day!. Phase two is still to come but that's just enhancements. I'm as proud as punch. I stuck my foot on a spade at 8.30am on June 10th 2014 and I put the last brick on yesterday (Friday). It's filled me with immense pride!" Pete Whiteley from Chesterfield Community Trust was also at the event and said he too was very humbled to see the garden being honoured, "The supporters have led on this but they have worked hand in hand with the Trust. It's amazing - a 'hair on the back of the neck' moment - and I don't think there's anything to compare in British football. "Part of it is looking to the Legion and the 16 players and staff who died in the conflicts, but it also for the community for supporters and if anyone wants their ashes here because they have some connection to the club, then they can be put in here free of charge - we'll sort that out." He added his thanks to Phil Tooley, "Phil does twist a few arms when you need to get something done. I thought this might be a long-term project, but to raise over £32,000 in the time we have done has taken a lot of effort. Phil's led on that and we're very grateful for what he's done!" His Worship The Mayor of Chesterfield said, "It's wonderful! In this special year, the 100th anniversary of WWI, that we come again to honour the people who lost their lives and their families. 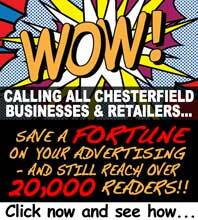 It's also somewhere that ordinary people can come - it just shows how Chesterfield Football Club is part of the community and I'm so pleased that they have taken the time to make this happen! "It's incredible they've nearly reached their target. They've put in a lot of work to make it happen. Without the community, they wouldn't be here!" 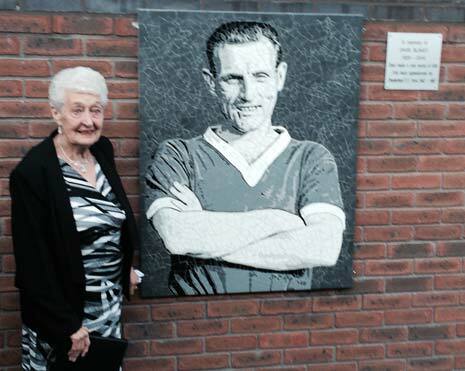 By far the most emotional moment of the evening came when Kathleen Blakey, widow of former player David who sadly passed way earlier this year, unveiled the memorial plaque in honour of her late husband. Having pulled away the curtain and seeing the plaque (created by Robert Lally) for the first time, she was clearly overwhelmed by the likeness to David (above). Afterwards, and still emotional, she told us of her pride, "It really is lovely. I am very proud. He was a fantastic husband, a lovely man, and he had lots of friends. He was a really nice man. I never expected anything like this - I just expected an ordinary plaque. "It's a good photograph of him, I have a big one of that at home. He would have been so proud. He loved Chesterfield and he never wanted to go anywhere else. The lad who did it did a fantastic job!"